2a High St is to be incorporated into the adjoining pharmacy. 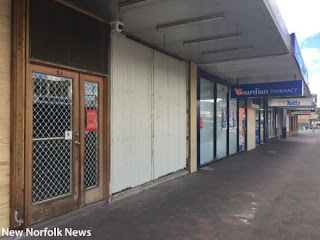 WORK has started on an expansion of the New Norfolk Guardian Pharmacy at the top end of High St. Proprietor Bel Bird said she was pleased to see the work under way after a long wait. The project will also see the existing shop given a new fitout. Established at 6 High St in the 1960s, the pharmacy expanded into 4 High St a decade ago and a first-floor office was added several years ago. The business will now extend into number 2a, which has previously been an office space. Locally owned and operated, the pharmacy will remain a Guardian outlet with the same staff, plus some new ranges, enhanced layout and a large consulting room. "The pharmacy will continue to trade seven days a week throughout the works, with minimal disruption to customers," Ms Bird said. The building work is expected to be completed at the end of March. Congratulations Bel Bird and thanks for your expression of confidence in the town. How the expanded pharmacy will look, stretching from 2a to 6 High St.